When you need to cancel a shipment, go to 'Manage Shipments'>'All' and click on 'Details' for the shipment you wish to cancel. Note: If you are using an Easyship integrated warehouse, you will need to contact the warehouse to ensure that an order which has a generated label is not being processed for pick & pack. Once done, please contact Easyship Support for assistance on cancellation. For customers not in an Easyship warehouse, you can follow the below steps to cancel your shipment. Click on the 'Cancel Shipment' button, and confirm the cancellation. You will be credited to your Easyship account immediately if the label has not been generated. If the label has been generated, you will be credited to your Easyship account after 30 days provided that you have not handed over the parcel to the courier. If you wish to be refunded to your method of payment, you will need to contact Easyship Customer service, note that additional processing days will be required. my cancellation of shipment since 3May2018, when can i make the refund? 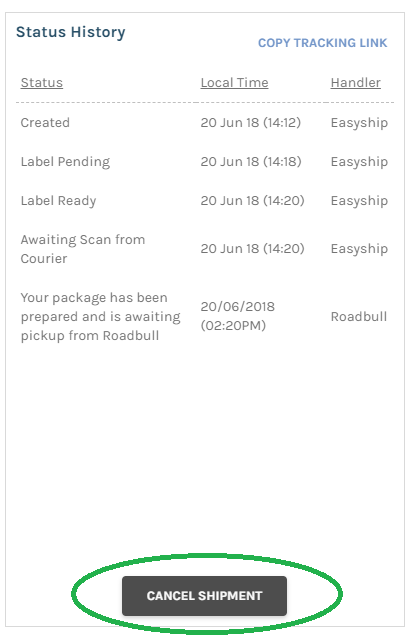 If the label has been generated, you will be credited to your Easyship account after 21 days provided that you have not handed over the parcel to the courier. are there any charges or will the refund be full? Provided the shipment has not been picked up by the courier, the refund will be made in full to your Easyship account after 21 days. Note that if the label has not been generated and you cancel the shipment, the refund will be made immediately to your Easyship account. Yes, a refund takes a minimum of 21 days to process if the label has generated. I can see that the amount has been refunded back to your account. We have started processing the refund back to your method of payment, kindly allow additional 2-5 business days for the transaction to process. Appreciate it if you can inform me when I will receive the refunds from 2 shipments as above. They stated "refunded" but I don't see any refund from you guys. Thank you very much in advance. You should see the amount available in your Easyship account when you login to Easyship.